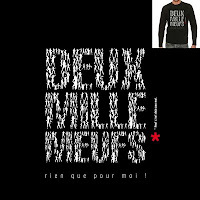 The title of this post comes from that of a French fashion line (they are not all out of business) and a play on the words in "deux mille neuf" where "meufs" is slang (verlan) for the ladies. That is, it is fantasy time. Fantasies can come true, of course. Except, to my knowledge (and experience), those involving 2009 nubiles. But in equity markets one realisable fantasy envisages a poor equity market in the first half followed by a decent pick up in the second as the volume of free money seeded by central banks eventually finds purchase in thin credit market soils. La chute des cours de la Bourse présente aujourd'hui une belle opportunité d'investissement: se placer sur les marchés financier à des conditions avantageuses. Alors pourquoi ne pas le saisir? Which, freely translated, means "don't be stupid, send us money to buy equities". Similarly, it has been possible on Bloomberg to hear things like "I like the Indian rupee" which on one level is actually a plea for company on the meuf chat-up circuit. Career-wise, you get to keep your job if you were rejected by a (for example) BRIC beauty at the same time as everyone else. Adds up to self-fulfilling stuff (and probably with the rise in the first half) whilst the world awaits sufficient trickles of "real" economic data to support - or reject - the assumption that policy is aggressive enough to reverse current growth trends this year. The effect of fiscal stimuli and near-free money on job and house price data, in particular, looks key. Happy New Year and stay nimble!